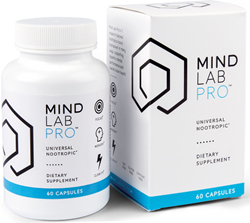 Opti-Nutra™’s Universal Nootropic™ brain supplement: Mind Lab Pro®. Vitamins B6, B9, and B12: Shown in research to help regulate high homocysteine levels, which have been linked to brain circulation problems and increased risk of cognitive decline. Mind Lab Pro®’s B6, B9 and B12 are also presented in a new form — Eco-friendly, lab-grown BioGenesis™, complexed with whole-food cofactors that help with nutrient absorption.